Former Indian President A.P.J. 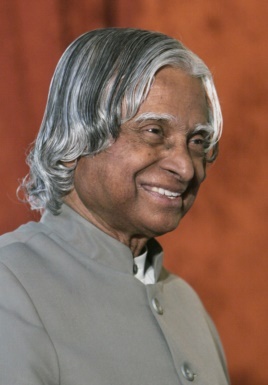 Kalam, who was known as the father of the country's military missile program, died Monday after collapsing while delivering a lecture, a top state official said. He was 83. President from 2002-2007, Kalam was a scientist and science administrator for four decades before that, mainly at the state-run Defense Research and Development Organization and the Indian Space Research Organization. He played a key organizational and technical role in India's nuclear program. Kalam fell sick Monday while addressing the students of the Indian Institute of Management in the Meghalaya state capital, Shillong, said B. Warjri, chief secretary of the state. He was rushed to the hospital, but was declared dead after doctors could not revive him, Warjri said. The federal government would declare national mourning for seven days for him, said federal Home Secretary L.C. Goyal. "He was an inspiration to an entire generation," Home Minister Rajnath Singh tweeted. Even after he left office, he received hundreds of emails each day from high-schoolers and young people seeking his advice. He would reply to most of the children who wrote to him.